Event Drafts are now replacing Event Templates. 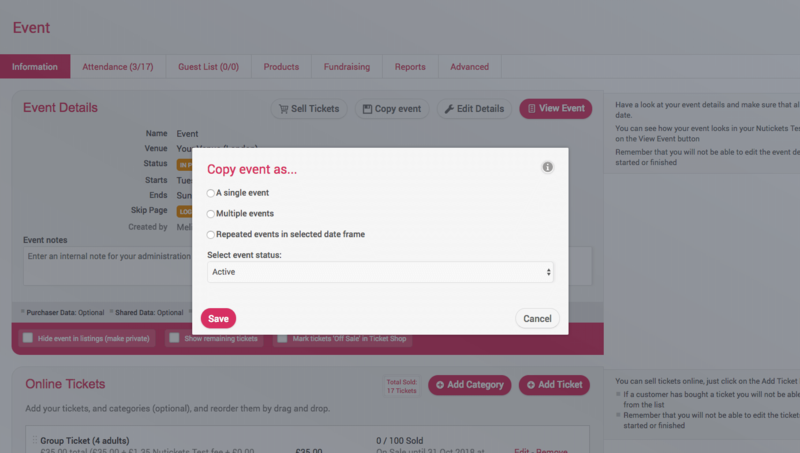 Event Drafts enable you to create events prior to publishing them, the perfect solution for preparing your events in advance enabling you to keep working on them until they are ready to go live. You can create Drafts by following the usual process: Events > Add Event > Save as Draft. Your Drafts are sitting under a new tab in the Manage Events section, and you can easily put them live them by clicking on the ‘Publish Event’ button. Once these events are published, you can view them and start selling tickets in the normal way. Go to the specific event and click on the ‘Copy Event’ button, then select if you just want to create a single event or replicate it for multiple dates. It will take a couple of minutes to process them, you will receive an email notification when they are created. These new events are accessible under the Manager Events section. What if I had an Event Template that I would like to carry on using? If you had an Event Template set up in the past, which you’ve used for creating events, you can still use it by finding the event you’ve created with that template, coping it and saving it as a Draft. Who can help me with questions about these new functions? If you’re stuck, get in touch with your Account Manager or email us on info@nutickets.co.bw, our team would be happy to talk you through these changes.